Producer/Director/Writer, Judy Chaikin, was born in Los Angeles, California, where she trained in music and dance. Her first professional job was as a chorus girl in Las Vegas at the Thunderbird Hotel. She returned to Hollywood and began serious acting studies eventually performing in live television, films, theater and several improvisational companies including the Committee Workshop. From there her career took many twists and turns, as Judy went from being an actress/dancer/stand-up comedienne, to a director/writer/producer. After a brief career in front of the camera, Judy found that she was more interested in the exciting challenges behind the camera and set her sights on directing. Immediately she was offered the opportunity to direct “WOMANSPEAK”, a stage production starring Jane Fonda and Judy knew she had made the right decision. 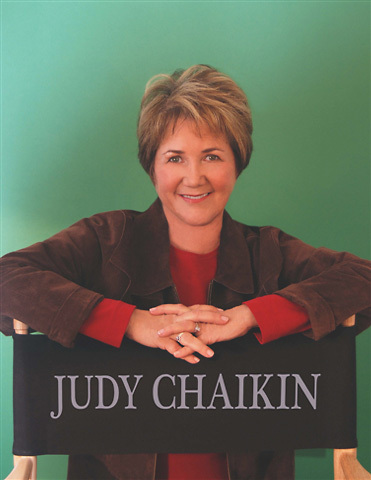 With a background in both comedy and drama, Judy moved between two worlds, producing and directing documentaries and educational films by day, and by night directing the improvisational comedy troupe “THE GROUNDLINGS,” where she worked with such notable talents as Lisa Kudrow, Jon Lovitz, Phil Hartman and Julia Sweeney. In 1992, Judy was hired as a producer/director on the ABC series “FBI: THE UNTOLD STORIES”, a position which she held for the two year run of the show. In 1994 Judy produced and directed segments for two NBCP Specials, “THE HORATIO ALGER AWARDS” and “TOO GOOD TO BE TRUE,” and in 1995, she co-produced the CBS Movie of the Week, “STOLEN INNOCENCE” for Hill/Fields, starring Tracy Gold and Thomas Collabro. In 1996 Judy wrote and directed the PBS documentary, “LOS PASTORES” and the following year she produced and directed “HOLLYWOOD REMEMBERS THE BLACKLIST” a multi-media stage presentation at the Motion Picture Academy’s Goldwyn Theater, starring Kevin Spacey, Billy Crystal, Alfre Woodard, John Lithgow, James Cromwell, David Hyde Pearce, Kathy Baker and Tim Daly. Next she directed the stage play “TRUE ROMANCES,” by Susan Yankowitz, with music by Elmer Bernstein, at the Mark Taper Lab in Los Angeles, followed by the one-woman show “EXCUSE ME, I’M TALKING” starring Annie Korzen, which opened on Broadway at the New Duke Theater and went on to a world-wide tour. Her current film, the feature length documentary, “THE GIRLS IN THE BAND,” is about the unknown history of women jazz instrumentalists from the early 1900’s to the present day. The film took top prizes at five film festivals including the prestigious Palm Springs Film Festival and is currently in theatrical release around the country.